Cookies: Stir together flour, baking soda and salt in medium bowl; set aside. Beat Fleischmann's and granulated sugar in large bowl with electric mixer on medium speed until light and fluffy. Add egg and vanilla; beat just until blended. Gradually add flour mixture alternately with sour cream, beating on low speed after each addition just until blended. Stir in cranberries, white morsels, chocolate morsels and pecans. Cover and chill at least 1 hour. Preheat oven to 375°F. Spray baking sheets with cooking spray. Drop dough by rounded teaspoons, 2 inches apart, onto baking sheets. 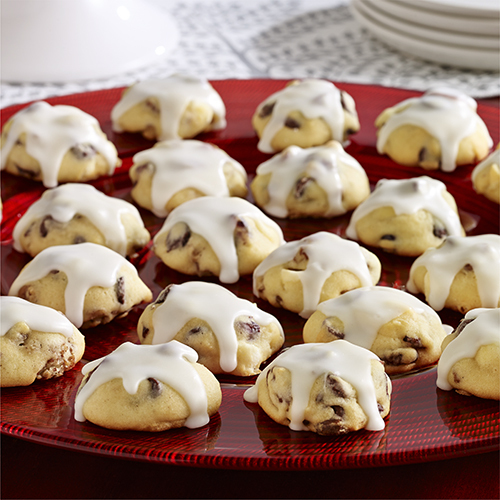 Bake 8 to 10 minutes or until centers of cookies are set and edges are browned lightly. Cool on baking sheets 1 minute; transfer to wire racks. Cool completely. Glaze: Place confectioners' sugar in small bowl. Add milk, a few teaspoons at a time, stirring constantly until glaze is of desired consistency. Spread a little glaze on top of each cookie. Let stand until glaze is set.